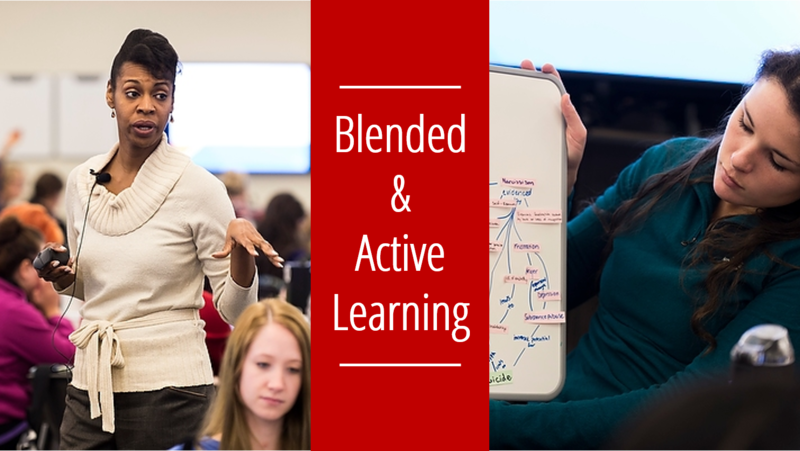 Both active learning and blended learning are research-supported and technology-enhanced teaching and learning methodologies. Active learning refers to a process where learners engage purposefully with instructors, other students and course content to promote problem-solving, application and understanding. A wide variety of technologies such as Google Apps for UW–Madison, Top Hat, Piazza and Kaltura MediaSpace can help foster active learning. Our Faculty Engagement service hosts the Active Teaching Lab where instructors share experiences with teaching tools and try out the new technologies in a relaxed, playful environment. Active learning classrooms on campus provide the technology, physical environment, instructional support and resources needed for active learning. Some schools and colleges have these classrooms, and any instructor can apply to teach in one of eight active learning classrooms in the Wisconsin Collaboratory for Enhanced Learning (WisCEL). In general, the term “blended learning” refers to the practice of using both online and in-person learning experiences, which can foster active learning. More information (including an overview of blended learning models), tutorials and resources are available at the Blended Learning Toolkit. In addition, programs such as Blend@UW and Blended Learning Fellowship Program can help faculty and staff apply this methodology to their courses. Whether a course is blended or fully online, DoIT AT’s Online Course Production service can provide assistance for the entire life cycle of course development – from conceptualization of the course with research-based pedagogy through the development of course media, activities and assessments that support desired learning outcomes. Hear about how DoIT Academic Technology supports teaching with technology in the below video.